The M2M Evolution Conference is for those industry professionals interested in capitalizing on a rapidly growing segment of the telecom industry. 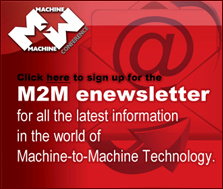 The M2M Evolution Conference embraces the any-to-any strategy of the Internet today. It showcases the solutions, and examines the data strategies and technological requirements that enterprises and carriers need to capitalize on a market segment that is estimated to grow to $300 Billion in the year ahead. General comments: tmc@tmcnet.com. Comments about this site: webmaster@tmcnet.com. Technology Marketing Corp. © 2018 Copyright.